DESCRIPTION:This 155 km (97mile) reinforced concrete aqueduct, voted among the world’s greatest engineering works” provides Winnipeg with water form Shoal Lake on the Manitoba-Ontario border, by gravity flow. It was completed in 1919. A 19 km (12 mile) branch was added in 1960. 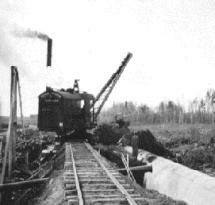 To facilitate its construction, the Greater Willipeg Water District Railway was built and completed in 1914. This 168 km (105 mile) railway remained self supporting for many years, hauling sand and gravel and transporting passengers. Today it remains the only means of access to the intake at Shoal Lake. LOCATION: The railway and the aqueduct occupy the same right-of-way from Winnipeg to Shoal Lake via Deacon, Millbrook, Monominto, Larkhill, Spruce, Hadashville (where it crosses the Trans-Canada Highway) and McMunn. BACKGROUND: At the end of the nineteenth century, the projected growth of Winnipeg necessitated a new water supply. Existing sources of water, the Assiniboine River and artesian wells, were not enough to meet expected demands. Many reports and studies were made and, in 1912, the report of Professor Charles S. Slichter, which recommend ”the water supply for the City of Winnipeg be taken from Shoal lake’, basing this judgement on the fact that this is the very best supply available,’ and as near as any city can expect to find”’, was accepted. The greater Winnipeg Water District was formed to administer the Shoal Lake project. An eminent U.S. firm of consulting engineers, Hering, Fuertes and Stearns, recommended the construction of an aqueduct. 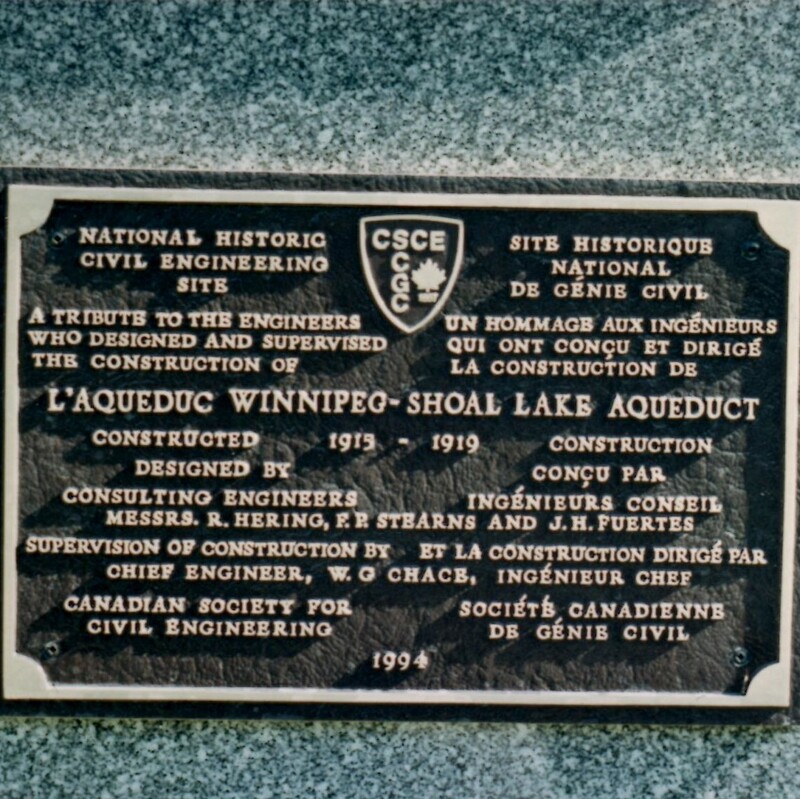 After the acceptance of the proposal and the International Joint Commission’s granting of the right to divert water from Shoal lake, construction started in 1914. The first water from Shoal Lake flowed to Winnipeg’s citizens in April 1919. All the works were designed in Winnipeg and many engineers were involved in the project. The contractors all were local and employed local labour.. Apart from Prof. Slichter and the U.S. consultants — Hering, Stearns and Fuertes — a local board of engineers was appointed. J.S. Sullivan and R.S. Lea served on this board. W.G. Chase was in charge of the construction. The prime contractors were the Winnipeg Aqueduct Construction Co., Thomas Kelly and Sons, the Lock-joint Pipe Co., and J.H. Tremblay and Sons Co.